Recently we celebrated the launch of our Roots Ethiopia Education Ambassador program, in which we took the two top-performing students from each of our partner schools on a trip to Addis Ababa. The week was a game-changer, broadening not just their appreciation of their country, but their sense of access to the wider world. It’s one thing to believe in the power of every child’s dreams. It’s quite another to see them catch fire in real time. The gift of our work in Ethiopia is the promise of children like Betsegaw. Betsegaw is a 14-year-old 9th grader who lives in the city of Hosanna. His top student marks in his primary school—one of our partner schools that draws some of Hosanna’s poorest students—earned him a spot on our Ambassador programs. And like his exceptional peers, he returned from Addis Ababa with new stars in his eyes. The architecture Betsegaw marveled over on his trip added fuel to the fire of his own dreams. Roots Ethiopia had the good fortune of visiting with Betsegaw so we could admire some of his own architectural creations; models built using brilliantly scrapped-together materials that he collects from the streets and local stores. Bravely practicing his English with us, Betsegaw showed off his small collection of working tools (scissors, paper, cardboard) and the first model he ever made, a hospital he assembled last year. After he constructed it, Betsegaw took the next step to find a mentor and seek out advice. A local architect suggested to Betsegaw that he next train his focus on building something more personal. 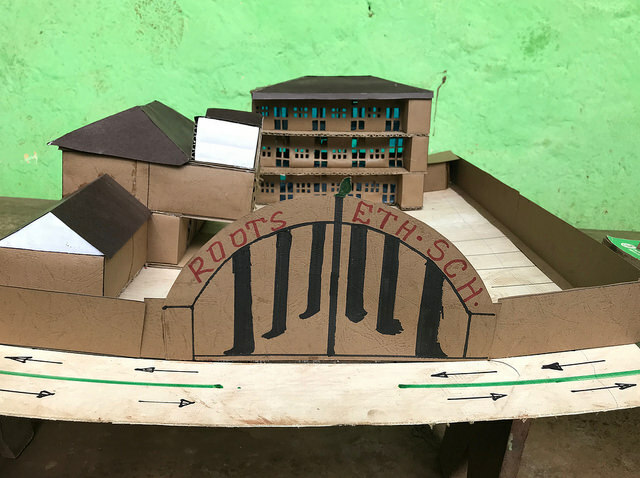 So, this young man set about designing a model of a Roots Ethiopia school. After all, school is Betsegaw’s kingdom. We celebrate this young man who has found his passion and created a way for himself to pursue it wholeheartedly. May he travel far in this world to feed both his imagination and his ideas.